What is Clinical Conductor CTMS? Clinical Conductor CTMS is a modular clinical research software that revolutionizes your methods and practices with staff credential tracking. It is compliant with the common regulations and standards for you to be secure and confident in your research. With Clinical Conductor CTMS as your companion in your sites, you can simplify the tracking of your finances, recruitment activities, the monitoring of studies, and the delivery of information-laden reports. Clinical Conductor CTMS is also a feature-rich solution that lets you perform your clinical trial-related tasks in a single interface. Thereby, you can focus more of your attention on your patients, save time, and increase your productivity. Clinical Conductor CTMS offers you real-time access to your clinical trial information. With the business intelligence module, you can turn these data into actionable insights as well as bases for making intelligent decisions in the form of custom reports. And for the sake of your stakeholders, Clinical Conductor CTMS lets you share valuable information with them. This means that you can disseminate any reports you generate with the software in soft form or hard copy. To ensure the timely extraction of information from patients, Clinical Conductor CTMS is equipped with a text messaging suite. You can use this to remind subjects of their appointments so they arrive in time at the data extraction site and eliminate the possibility of missed visits. Clinical Conductor CTMS has a dedicated portal for any partner you may have who are not utilizing the same solution as your research organization. This facilitates the swift and convenient exchange of information that allows your studies to move forward rapidly without any loss of data. Searching for participants can be a challenging task but Clinical Conductor CTMS eases it for you with its web recruitment page. You can integrate this into your organization’s website to make it easier for interested parties to sign up as subjects. This also streamlines your selection process as the portal enables you to pre-screen potential participants. As individuals sign up for your research, you can ask them to answer surveys and open ended questions on the Clinical Conductor CTMS screening window. These assessments are customizable so you can modify them every time you need to. Plus, it saves you time in evaluating prospective subjects. Clinical Conductor CTMS allows you to devote more of your time on your subjects and the progress of your studies. That is because you can configure milestones that you can track actively yet easily as you go along. Other than that, the solution automatically notifies you of events and of following tasks. A unique feature of Clinical Conductor CTMS is the tracking and management of staffs’ credentials. This allows you to make sure that every member of your research team has the required skill set and are updated with the most innovative practices and procedures in the field. Additionally, this lets you track the expiration dates of their certifications so you can send them to training centers and conference venues to renew their certificates. If you are considering Clinical Conductor CTMS it might also be a good idea to check out other subcategories of Best Clinical Trial Management Software gathered in our database of B2B software reviews. Since each organization has unique business requirements, it is prudent for them to abstain from searching for a one-size-fits-all perfect software solution. Needless to say, it would be futile to try to find such a system even among popular software platforms. The clever thing to do would be to jot down the various important elements that require consideration such as required features, finances, skill levels of employees, company size etc. Then, you should do your homework thoroughly. Read some Clinical Conductor CTMS reviews and investigate each of the other apps in your shortlist in detail. Such in-depth groundwork can ensure you discard ill-fitting applications and select the system that provides all the aspects you require for business success. How Much Does Clinical Conductor CTMS Cost? 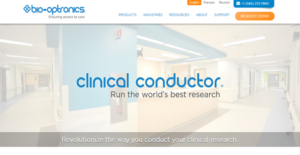 Clinical Conductor CTMS is an innovative clinical trial software. It enables you to be more efficient in your studies and it allows you to streamline your organization’s research tasks further. If you are interested in the solution, you can request custom enterprise pricing from the sales team by phone, email, or web form. We realize that when you make a decision to buy Clinical Trial Management Software it’s important not only to see how experts evaluate it in their reviews, but also to find out if the real people and companies that buy it are actually satisfied with the product. That’s why we’ve created our behavior-based Customer Satisfaction Algorithm™ that gathers customer reviews, comments and Clinical Conductor CTMS reviews across a wide range of social media sites. The data is then presented in an easy to digest form showing how many people had positive and negative experience with Clinical Conductor CTMS. With that information at hand you should be equipped to make an informed buying decision that you won’t regret. What are Clinical Conductor CTMS pricing details? What integrations are available for Clinical Conductor CTMS?